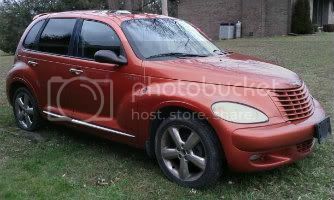 I have 2001 pt cruiser that I purchased from my father in law in 2004 with 48,000 miles. He purchased it new so I am the second owner. I recently purchased a gates timing belt kit with water pump, tensioner, and idler pulley due to the fact that I was close to 100,000 miles. Well the belt broke at 98,500. Not too bad for a 13 year old car. I literally ran the 2 miles home and picked up my jeep to tow it home. The belt wrapped around the crank gear and broke the bottom timing cover so I had to get a new one. Being close to 100,000 miles I figured I would also replace the control arms, tierods, swaybar bushings, thermostat and coolant. Over the last week I was able to replace all front end components, and the timing belt, alt belt and serpentine belt. I just wanted to say thanks to this site for all the valuable information. It made all of this much easier. Front end components were replaced with moog parts and took 2.5 hrs to do. Timing belt, water pump, belts, tstat, coolant, and front brake pads took 10 hrs total. Total cost under 500 bucks plus another 500 for tires and an alignment. Not too bad considering labor alone would have been 2,000- 3,000 for all work done. CREWZIN, quicksilverdon, cdynaco and 7 others like this. All repairs and service done by me. Your our kind of people. Great job. 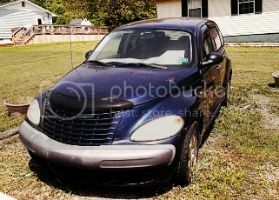 It was alot of work but now I got a pt cruiser good for another 98,500 miles. It really is like new with the suspension and tires. I couldnt have done it without this site and the info it provides. Also I got lucky and got the timing right on the first try. I was worried where the old belt had snapped or more accurately shredded itself to pieces. UptownSport, Handy_Cruiser and boonie2 like this. Also I got lucky and got the timing right on the first try. With all the collective info (old & new) on this site,a little luck never hurts also. cruserdad1976 and Quits like this. When I did the one on the how to thread. It lined up perfect. I read that it would be a tad off. So I did it again and it just keep being perfect. So I decided that I would have to live with it. You sure were lucky to have the belt break (if it HAD to break!) so close to home. I may have missed past threads but I just wanted to know if you (or anyone) can tell me how I check to see how the timing belt's doing? 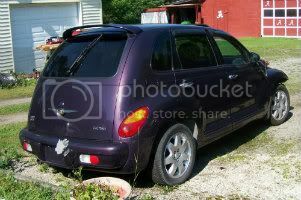 My '05 has 82,000 miles on it but think I may be good for a little while yet, but how do I find out the current condition of it to try to make sure I have it done in time? I planned on doing it some time between 90,000 and 100,000 miles. ANY help would be greatly appreciated! You can remove top cover. But it can be hard to tell by looking. Unless it looks really bad. Soory I'm not much help.